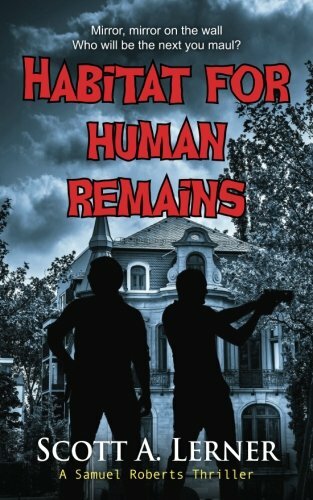 “Habitat for Human Remains” is the fifth book in the Samuel Roberts series by Scott A. Lerner. Roberts is a cynical private practice lawyer who finds himself involved in a murder case with a cast of characters that have their own agenda. The accused is Blake May who lives with his mother who is blind but is extremely attuned to what is going on around her. Blake suffers from agoraphobia, and obsessive compulsions, and is accused of killing his girlfriend and destroying her remains, to the point of being unidentifiable. The police are unable to find a murder weapon or fully understand Blake’s relationship with his girlfriend Heather, since he rarely leaves his room. The Frost Home dates back to the 1800s and in itself is a very spooky living environment. The butler who is mute reminds Sam of Lurch on ‘The Addams Family,’ and Laura James the maid is as friendly as a pit bull. It appears to Sam and his sidekick Bob Sizemore that more is going on than it seems and that everyone is trying to get Blake declared insane. Lerner’s urban fantasy is full of surprises, quirky people and deep deception. Sam and Bob are not the usual handsome, rich lawyers but are shown to be down to earth and often like Laurel and Hardy. Lerner’s vivid description of the murder scene, magical mirror and unusual characters adds so much to the story line. Dialogue between the characters struck me as funny and distinct for each character. This is what kept me reading along with all the hidden agendas of everyone involved. This is not one of those reads where one thinks they can solve “who did it” as each chapter has new twists and turns. I am not one who is familiar with paranormal fiction, but I will say Lerner’s book was quite the page turner. It is not a fast read as one will want to savor every scene, relationship and cast of characters. Lerner does an excellent job of keeping the reader’s attention and the description of Blake’s self-contained living area is quite amazing. I highly recommend “Habitat for Human Remains” by Scott A. Lerner to all who love great mysteries that add some paranormal excitement.